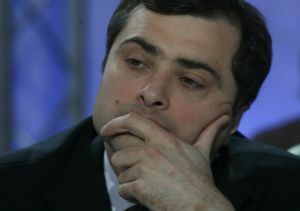 Chief Kremlin ideologist and First Deputy Chief of Staff Vladislav Surkov made a rare foray into the limelight on Friday to call for decisive moves to defend the middle class from the on-coming economic crisis. This suggests that the government is slowly beginning to wake up to the gravity of the crisis and the potential implications for its popularity, which has been built on appeals to the middle class' concerns about "continuity" and "stability." Surkov is known for his reclusiveness, mercurial intelligence and reputably superlative influence inside the Kremlin and United Russia (Kremlin watchers almost eulogize him). As one put it, "not knowing who Vladislav Surkov is, is like not knowing who Cardinal Richelieu was in 17th Century France." So when he gives a speech, people take note, both of the fact he is making it and of the message that he is trying to get across. The message in Surkov's speech was captured in one sentence: "The main task of the state during the slump must become the preservation of the middle class." The simplicity of this message is telling. It suggests a tacit admission that there is indeed a threat, growing concern in the government about its scale, and an awareness of the dangers it poses to the ruling party's popularity ratings. The "middle class" has been a constant subject of debate in Russia in the past years, its existence and growth meant to be a key marker (along with "civil society") of the country's progress toward democratization and economic well-being. And though democratization may not have emerged alongside it, a credible middle class (in the financial, if not the political sense) has certainly developed. A poll in April by the All Russian Information Center (VTsIOM) estimated that 39 percent of the adult population either counted themselves amongst the middle class or expect to join it within the next ten years. Emblems of membership of that class - Ford Focus cars and furniture from IKEA - have become ubiquitous. And though the self-identifying middle class is predominantly young (42 percent of 24-25 year olds, as opposed to 27-33 percent of 35 -59 year olds), and predominantly judged by income rather than education, it is analogous to the Western middle class. And it is also true that it is in need of help. VTsIOM reports that in the past few months, confidence in the future has nose dived, and the middle class has stopped growing (in April, 24 percent of respondents believed they would be in the middle class in ten years). Surkov's message of assurance will thus be welcomed by many who are uncertain about the future, and it is no doubt intended to do so. But, partly because of the man who said it, many experts believe it is more sincere than most statements meant for public consumption. Russia's emergent middle class, like its Western analogues, is instinctively conservative in sentiment. "Their key concerns are continuity and stability: to keep things going as they were before to make sure everything is fine," said VTsIOM's Olga Kamenchuk. Much of United Russia's success is built on its ability to woo those sentiments, and with remarkable success. "They support United Russia as the party which more or less provides for stable development; that is also why they were in favor of the idea of Dmitry Medvedev becoming president," said Kamenchuk. The middle class is thus singularly important as a source of popular support for United Russia. Other areas of policy reflect this - the government's strategy for socio-economic development to 2020, approved by Prime Minister Vladimir Putin last week, outlines plans to expand the segment to 50 percent of the population. That suggests that Surkov's message, in all its simplicity and directness, is quite sincere; for United Russia the middle classes must be protected. But recognizing a problem is not the same as finding a solution for it. Moscow Carnegie Centre's Nikolai Petrov, who is following the social and political impact of the crisis, believes that fully protecting the middle class from all harm is probably impossible. In that case, the government's constant assurances could backfire. "It is inevitable that at a time of crisis the government's ratings will fall; and the longer the government plays down the crisis, the greater the disappointment will be when it hits," he said. Worse, Petrov worries that even while playing down the crisis the government is procrastinating on taking real action. "They are still trying to implement policies in all directions, which is when what they really need to be doing is setting priorities," he said. Surkov's speech, while obviously playing a public role of reassurance, may also be tentatively welcomed as an attempt to start setting such priorities. Again, this is supported more by the fact the "grey cardinal" delivered the message, than by its content. "When Surkov says something in public it means he has a message he wants to send. And that message is not just for the party mainstream; it is addressed to all levels," noted Petrov. Whether he will succeed is doubtful. If the impending crisis is as long and serious as many experts anticipate, the middle class will certainly suffer, though the blows may be in some way cushioned. The question from Surkov's (and United Russia's) point of view is how much of a battering the middle classes can take before they lose their customary docility. Pessimism about the economy has not yet translated into discontent with the ruling party. VTsIOM's social well being indexes, which track people's confidence in the future, have all taken a dive in past weeks - with the exception of the political index. That could well change, but how or when is one of the great unknowns of the coming year.